LONDON--(BUSINESS WIRE)--According to the market research report released by Technavio, the compliance training market for financial institutions in the US is expected to accelerate at a CAGR of more than 15% during the forecast period. The increasing emphasis on mobile-based learning is one of the key factors triggering the growth of the market. This research report titled ‘Compliance Training Market for Financial Institutions in the US 2018-2022’ provides an in-depth analysis of the market in terms of revenue and emerging market trends. It also includes an up-to-date analysis and forecasts for various market segments and all geographical regions. In 2017, the professional courses segment accounted for 56% share of the global market. Professional courses are generally delivered through classroom-based training and have a premium price when compared with the prices of introductory courses. Thus, the segment is expected to remain dominant during the forecast period. The increasing emphasis on the use of analytics is an emerging trend in this market space. Owing to the growing popularity of analytics, many financial institutions are steadily adopting tools for analytics and effective report. These financial institutions are opting for vendors that provide advanced solutions supported by analytics and training. The acceptance of the concept of analytics has increased in the banking sector. Using advanced analytics-based solutions, banks in the US are managing the increasing cost of compliance. The inclusion of analytics and big data have brought many changes in the operations of companies, and they also provide training sessions to employees. 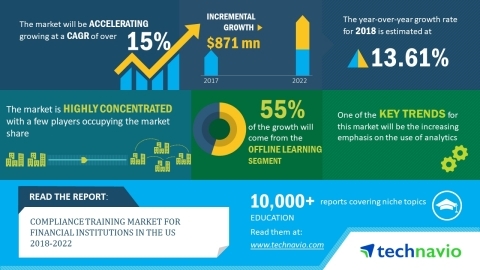 According to the report by Technavio, the compliance training market for financial institutions in US is set to post a CAGR of over 15% until 2022.